To add a benchmark to the chart, click on the ‘Benchmarks’ button and select one or more benchmarks from the drop-down list. 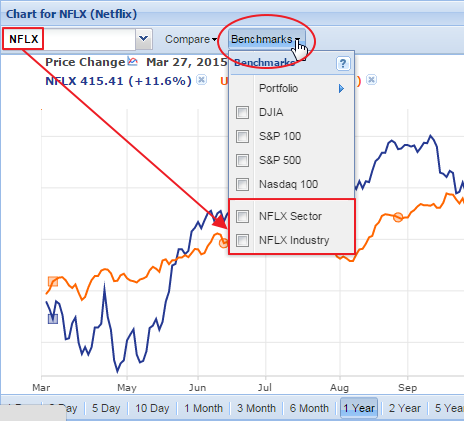 A benchmark can be an index, one of your portfolios, or the sector or industry of the of the stock in the main chart box. Like stocks, benchmarks can be set as baselines, which makes it easy to view a stock’s performance relative to the benchmark. You can add multiple benchmarks to the chart, but note that you cannot chart more than twelve lines at a time.